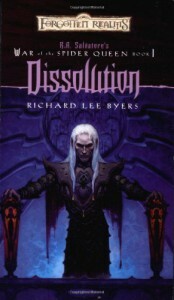 Dissolution - Richard Lee Byers - review - Level up! So, for his next series, R.A. Salvatore farms out the actual writing of the series to six other authors. Part of me wants to criticize him for being lazy and not writing his own stuff, but mostly, it just comes out as admiration-- I'd totally do the same if I were in his position. So, this is a book by RA Salvatore by Richard Lee Byars. I'm not sure how much involvement each author had in the book. The byline simply lists Richard Lee Byars, but some of the characters are Salvatore's. The world is Salvatore's (or TSR's by way of Salvatore). So, as far as I can tell, Richard Lee Byars' involvement is more or less transparent. About the only thing I notice (apart from better copyediting- HA!) is that Byars likes some fancy be- words "bespeaks" "bestir"
The story? fun! 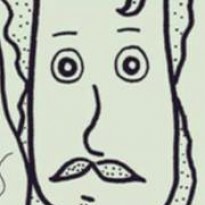 Salvatore has learned that you don't actually need a good guy to have a good story. So, all these evil, scheming dark elves betraying each other and stuff. Totally fun. I really like the introduction of the character Pharaun (again, probably Salvatore's character?) -- he's the Oscar Wilde of the drow elves, and he's a good sight more interesting than many of his fellow elves. I can tell that he's probably going to be the main character for this series, and if so, that's a good choice.